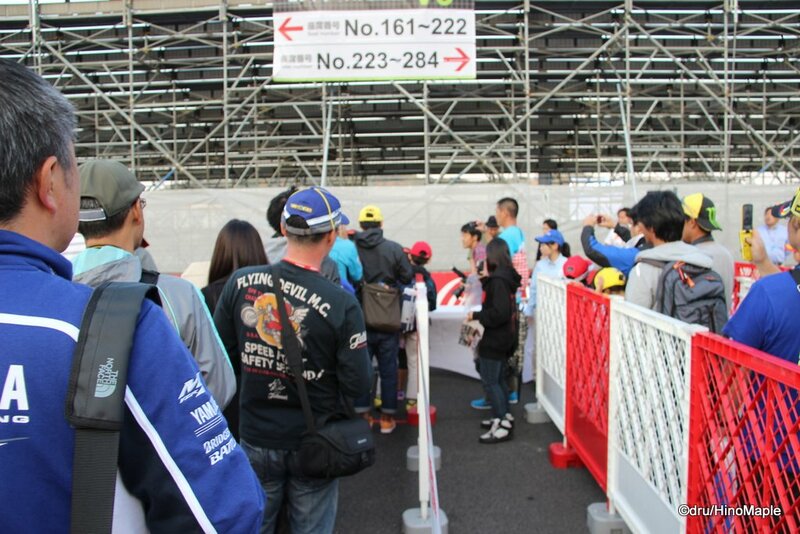 Every year, the Grand Prix of Japan holds a special signing session with all of the MotoGP stars. Most races have something similar but the MotoGP one was a little different, from what I have been told. The first thing is that you can only meet one of the riders. The second is that it is random. The third, and final, thing is that it is a lottery to get the opportunity to get their signatures. 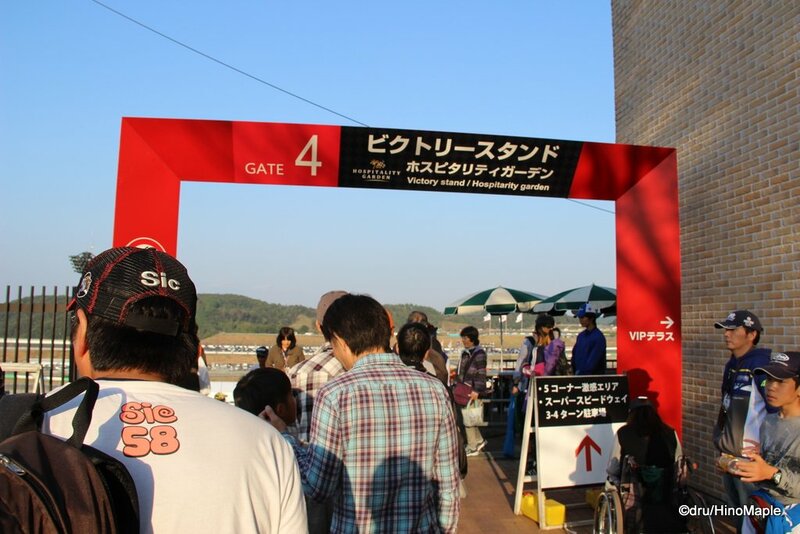 When you arrive at the track, the first thing you should do is head to the main entrance. At the main entrance they set up a tent where you can reach into a box for a chance to win. You dip your hand in and you see what you get. 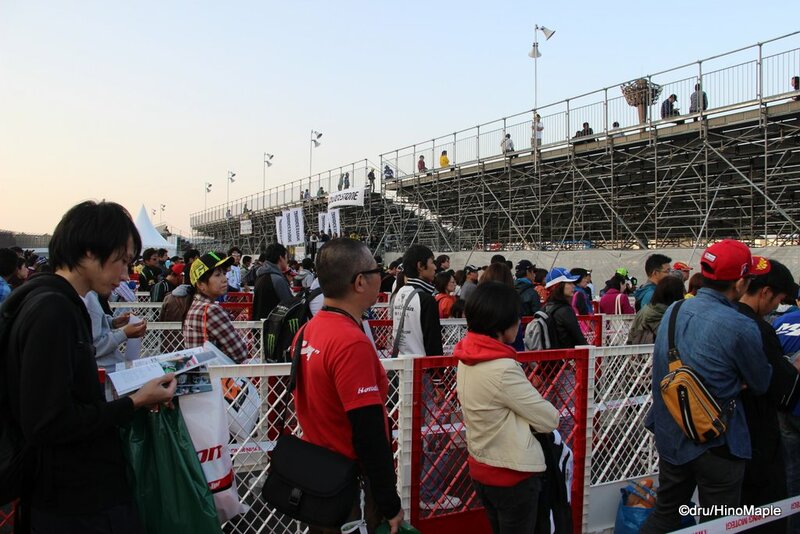 800 people and 200 kids are sent to meet a MotoGP rider. When you pull out the slip of paper, if nothing is written inside, you don’t win. If something is there, you win. I was lucky enough to win! Once you get your small piece of paper saying you won, you then go to the prize table where you get another piece of paper. This is instructions for the signing session and where to go. Mine told me that I was in group “J” and that I had to be at Gate 4 at 3:50pm. There were also a lot of instructions on what I could and could not do. I was only allowed one item to be signed, no photos were allowed, and I couldn’t go on the pit walk if I had tickets for the pit walk. The only problem I had was that they sometimes ran late with interviews up in the main party area and if they were late I would be late for my bus. I was nervous to say the least but I had to go. Once the MotoGP qualifying was over, I made my way over to the lineup. The lineup started almost an hour before the actual action began and kept going for a long time. 1000 people is a lot of people but I think I was in the top 200 to get in line. Don’t forget that families with kids got to go together, so while 200 kids were going, you have to add another 200-400 for their parents! 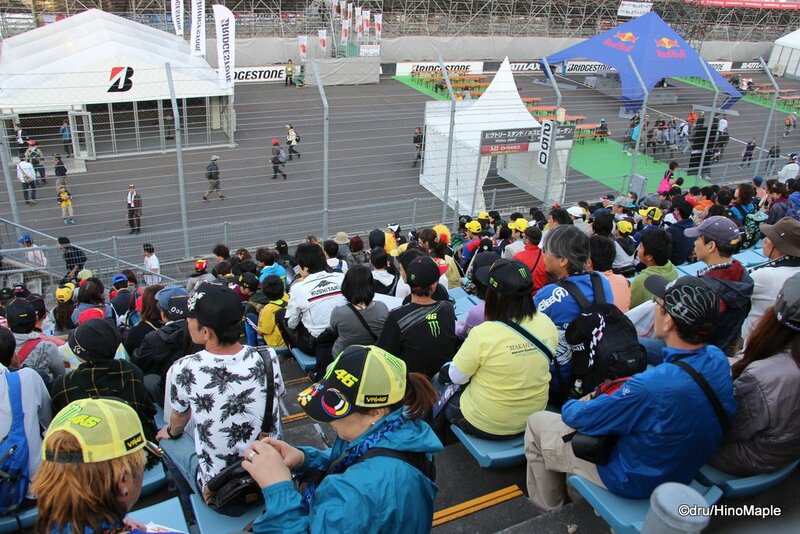 The first thing they did was get everyone into the grandstands to just sit and wait. They tried to explain things, in Japanese of course, but they used words that I was not used to so I was at a complete loss. It is pretty easy to understand overall but it just took a lot of time. Follow the line and sit down. Once the signing area was ready, they started to bring everyone to the signing lines. At 4:30, they had families go first before they let some other group go in. I’m not sure what the first group was but by the time I asked, they just said everyone could go. At that time it was a mad dash, rather a painfully slow walk, to get there. Everyone would have their turn but since I was on a time limit, I had to try to get near the front. Somehow my group was not so busy. Other groups were pretty busy and my line wasn’t. I guess it really is a random selection of who goes where. Once you do find your line, you may be waiting a few minutes or you may be waiting an hour. It really depends on who gets there at what time. 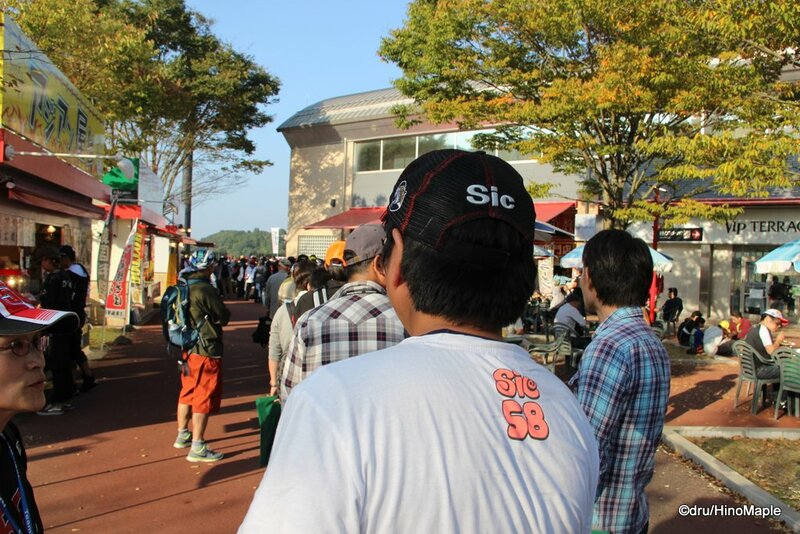 There are various interview obligations that the riders have after qualifying and they will try to get to the autograph session as quickly as possible but it isn’t always possible. As I was waiting in line, the first 2 riders arrived. Tech 3 didn’t have too many interview obligations so Bradley Smith and Pol Espargaro were the first. Bradley Smith chose L or something like that and Pol Espargaro chose J, my number. I was happy but sad at the same time. I was happy that I could get up close with last year’s Moto2 champion but sad that I couldn’t meet Valentino Rossi. He was the main target for me but it could have been worse. There are riders that I am not fond of but I do like Pol. The only problem was that I couldn’t get a photo with him as there was no time allowed and they mentioned something about Dorna being upset about it. It doesn’t matter as I was allowed to meet him and get his autograph. The signing is a lottery and you never know if you can get in or who will be your choice. I was lucky this time and not sure if I can be lucky again. I hope to get lucky again as I had the time of my life! 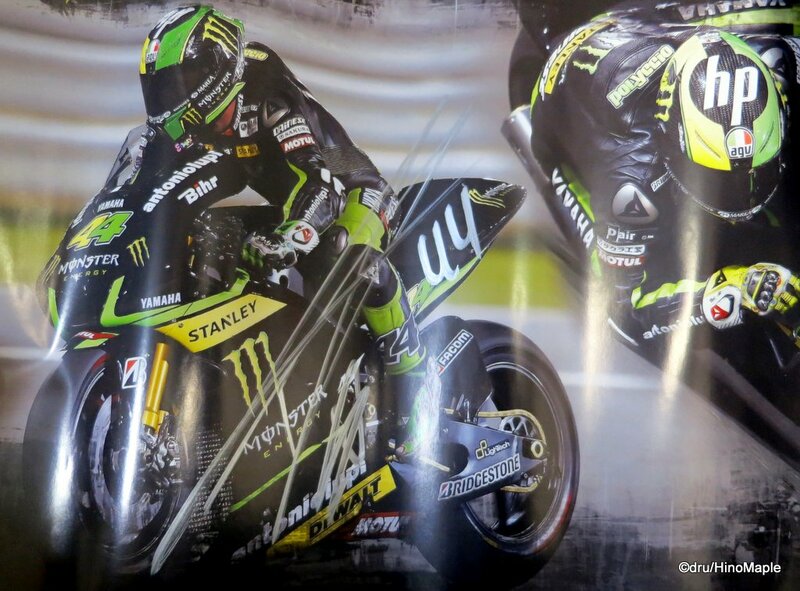 This entry was posted in Motorsports and tagged Fan Signing, japan, Motegi, Pol Espargaro, Tech 3, Twin Ring, Twin Ring Motegi, Yamaha by Dru. Bookmark the permalink. so happy i found this article. 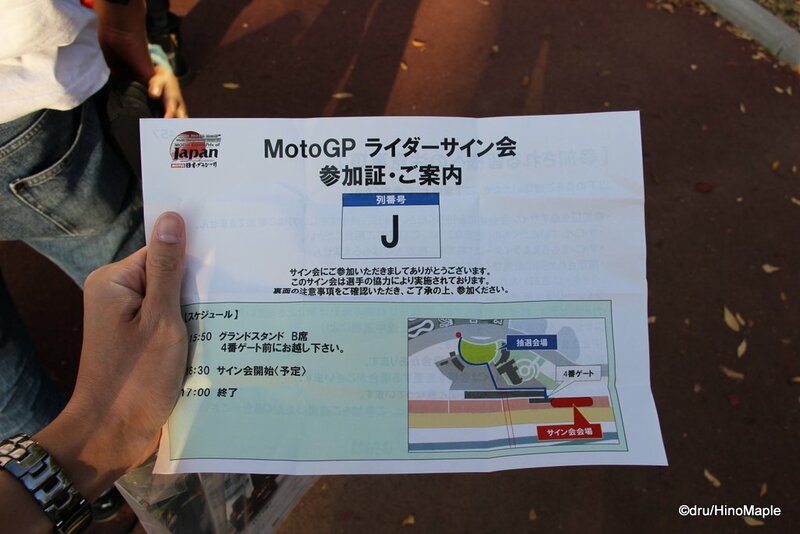 i will motogp japan this year. alone. if you dont mind can i join with you?? hy dru, i have a question., what day moto gp fans signing is? friday, saturday, or sunday? This year they are doing the fan signing on Friday only. It used to be on Saturday but they moved it to Friday from last year. how about the paddock pass ticket? if i buy the ticket for saturday, is that ticket for one day full or only for limited time? 1 day paddock passes are good for the whole day. You can go in and out as you please.